Jimmy Su is a PhD candidate in the Department of Biomedical Engineering at Northwestern University. Jimmy is originally from New Jersey in the United States, but he attended the Johns Hopkins University in Baltimore, MD where he received a Bachelors of Science in Biomedical Engineering before moving to Chicago to start graduate school. As an undergraduate and recent graduate, he was involved in a variety of research experiences, including the Amgen Scholars Program at Columbia University and an internship at a microfluidic device startup, Euveda Biosciences. Jimmy’s research interests include biomaterials and regenerative engineering. At Northwestern, he is co-advised by Ramille N. Shah and Jason A. Wertheim, and his dissertation research explores cell-cell and cell-matrix interactions of two kidney-specific cell types, glomerular endothelial cells and podocytes, within the context of 3D-printed structures. Outside of research, Jimmy enjoys photography, trying new foods and places to eat, reading, and playing video games. What was your position at CELLINK? How long were you at CELLINK? How did you find out about CELLINK? I first learned about CELLINK from their exhibitor booth at the 10th World Biomaterials Congress in Montréal, Canada. At the time, Erik Gatenholm, the CEO, was manning the booth and demonstrating the capability of the INKREDIBLE Bioprinter at its extremely economical price point. While the exhibition booth and what CELLINK had to offer was appealing, I didn’t look too much into the details. Fast forward a few months and I found myself searching for interesting companies to intern at. I specifically put together a list of 3D bioprinting companies to reach out to as my current graduate research includes 3D bioprinting for tissue engineering and regenerative medicine applications, and CELLINK was one of the companies at the top of the list. 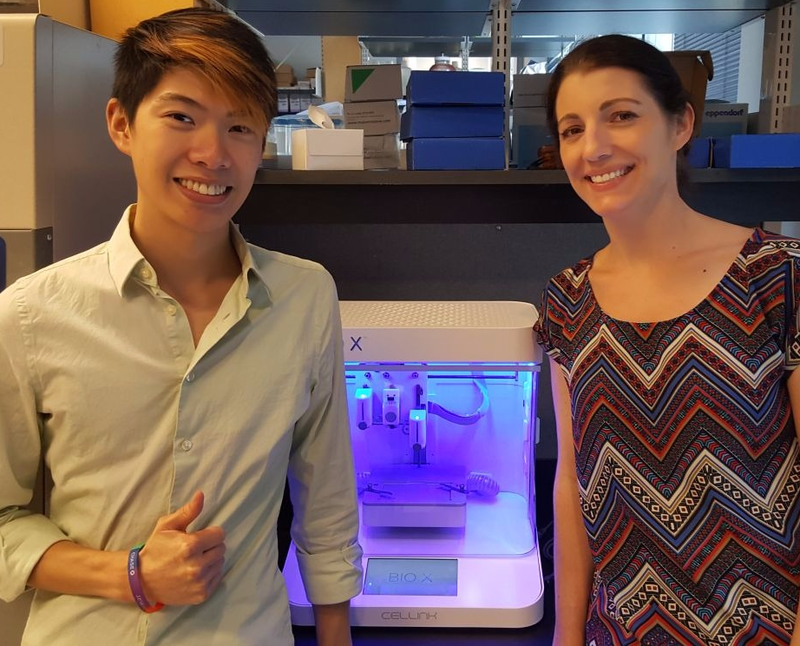 What led you to working with 3D Bioprinting? During my undergraduate education at the Johns Hopkins University, I was exposed to exciting and innovative research from all areas of biomedical engineering. This exposure inspired me to contribute to our understanding of valuable scientific questions and provide solutions to relevant engineering problems that will improve standards of care and the lives of patients. In particular, I became enamored with tissue engineering and regenerative medicine. While the prospect of creating tissue substitutes and transplantable organs in the laboratory may have once been science fiction, it is a near reality now. Such advances have the potential to impact millions of patient lives. Upon entering graduate school, I joined the laboratories of Ramille N. Shah and Jason A. Wertheim. Both of the labs explore novel approaches in tissue engineering and regenerative medicine for different tissue targets and organ systems, but in particular, the Shah Tissue Engineering and Additive Manufacturing Lab specializes in the development of 3D-printable materials for a variety of applications including 3D bioprinting. As a graduate student and researcher in the lab, I’ve had the opportunity to gain a greater understanding of additive manufacturing and 3D printing processes, appreciate the properties that make certain materials 3D printable, and hopefully contribute to the development of novel inks for 3D printing. Please give a detailed description of your internship and what you worked on. Several months before beginning my internship, my supervisor Héctor Martínez, the CTO, had asked that I put together a project proposal so that I would have an idea of what I would be working on during my time with CELLINK and so that we could plan ahead in terms of acquiring reagents and cells. The proposal that was eventually approved involved incorporating growth factor-mimetic peptides into CELLINK GelMA (gelatin methacryloyl) to enhance the bioactivity of the bioink, specifically targeting vascularization of printed constructs. The project was divided into two phases: the materials synthesis and characterization, and the bioprinting and analysis of cell response. The materials synthesis and characterization phase was originally set to take place at the Blacksburg site, but course of action changed. The actual synthesis was carried out in Gothenburg. Who knew I would end up in Sweden? I was ready for an adventure. During my time in Blacksburg, I worked with Bioink Officer Patrick Thayer to characterize the printability of CELLINK GelMA. After becoming acquainted with the INKREDIBLE+ Bioprinter, I set about collecting mass flow rate and printability data of CELLINK GelMA extruded through various nozzle gauges and at different applied pressures. In addition, there were days when we would explore collaborative projects for new potential bioink formulations or interesting applications for some of the bioinks already offered by the company (for example, Prototyping Networks and Conduits). After my first month in Blacksburg, I moved to the Gothenburg site to conduct the necessary cell studies. Prior to the studies, of course, there was a lot of prep work such as expanding the cells and ensuring I had enough bioink and modified peptide. The study itself involved the bioprinting of the constructs with necessary control and a experimental groups, maintaining the constructs in culture, and analysis of cell response (mainly cell viability). However, in addition to the cell work, I also spent a lot of time on additional characterization of CELLINK’s bioinks. Of particular importance during this period was the access to the rheometer, an instrument that is able to measure characteristics of viscoelastic materials, that is, materials that exhibit both solid-like and liquid-like properties. Materials that are suitable for 3D bioprinting applications are almost always viscoelastic, and a rheometer is able to determine the amount of solid-like and liquid-like properties a material exhibits under specific conditions such as those applied during the 3D printing process. Altogether, the results from my project have been summarized in an abstract accepted for the 2017 Biomedical Engineering Society Annual Meeting and have laid the groundwork for future investigations and bioink development at CELLINK. What would be your advice for future applicants/people taking your position? Be flexible! As an expanding startup company, CELLINK has a lot going on and everyone tends to pull together to help out. That means that sometimes it’s necessary to go beyond your project description to help get things accomplished. Working well with others on your team to manage a project more efficiently or make a deadline is a necessity. But more importantly, one person’s expertise is always limited; however, that knowledge is important and is usually needed by others. It’s the flexibility of everyone at the company that enables superior customer support and continued success. Be organized! Keeping a clean and organized lab notebook (preferably an electronic one) with detailed notes is important in all types of research, but especially as an intern where the work is important and will likely need to be reproduced by others at the company (or future interns!) or even be adapted into standard operating procedures. In addition, organization of reagents, materials, cells, etc. and documentation of where these items are located is essential for a growing company where things could easily get lost in transition. Be passionate! I could advise that hard work is very well appreciated (and it certainly is! ), but when you are passionate about something, working hard is second-nature. At a startup company such as CELLINK, it’s typically easier to explore new ideas and carry out plans that you envision than at a larger company, and hopefully this means that you will be passionate about what those plans are and motivated to reach the goals that you set for yourself.